"I have from him one of his symphonies, which I keep in memory of one of the greatest geniuses that I have met". "I have only this one work, but I know that he wrote other outstanding music." These two quotations - dating from different years - are from none other than Joseph Haydn expressing his admiration for Joseph Martin Kraus. He is one of the composers who for a long time was overshadowed by Haydn himself and by Mozart - whose exact contemporary he was. But that has changed, and if I am not mistaken it was largely due to two discs of his symphonies recorded by Concerto Köln that the musical world realised that Kraus was an excellent composer who deserved to be rescued from oblivion. That recording was recently reissued and reviewed here. Kraus received an excellent musical education, from members of the court orchestra of Mannheim, the most celebrated orchestra in Europe. This would have been around the middle of the 18th century. He studied philosophy and law at various universities and became involved with one of Germany's literary circles, the 'Göttinger Hainbund'. During his studies in Erfurt he was educated as a composer by Georg Peter Weimar, a pupil of Carl Philipp Emanuel Bach, and Johann Christian Kittel, one of Johann Sebastian Bach's last pupils. In 1778 he went to Stockholm, where the most important stage in his career took place. The sacred music by Kraus has, to date, received little attention. Not that there is much to pay attention to, as his oeuvre in this genre is relatively small, and some of it has disappeared. New Grove mentions two oratorios, one of which is lost; the other has been recorded in 1998 (Der Tod Jesus; Carus, 1998). There are also some smaller pieces: sacred arias and motets. The two large works on this disc are among his most substantial. They were written before his time in Sweden. The disc opens with a setting of the penitential Psalm 50 (51), Miserere mei, Deus. It dates from 1773, when Kraus was studying in Erfurt. The work is scored for four solo voices, choir and an orchestra of two horns, two oboes, bassoons, strings and basso continuo. The tracklist adds flutes and clarinets in brackets to the scoring, and apparently they are used as alternatives to the oboes and horns. The booklet doesn't mention whether these are added as alternatives by Kraus himself or whether their inclusion is a decision by Michael Schneider. The work begins and ends with choral sections, and in between tutti and soli alternate. There is some text illustration, including ascending and descending figures, but much less than in sacred music from the baroque era. The tutti sections are mostly homophonic, but there are some fugal episodes as well, as in 'Ne projicias' and in the closing 'Sicut erat'. This psalm contains some nice contrasts which are inspired by the text. Operatic elements are rare; one is the bass aria 'Docebo iniquos vias tuas' in which the words "convertentur" (turn) and "exultabit" (sing in joy) are set to virtuosic coloratura writing. 'Sacrificium Deo' is one of the most expressive sections whose appealing character is especially expressed by the solo part for the alto. This is ingeniously interwoven with the choral part. The Requiem dates from two years later. It is not known for which occasion it was written. The orchestral scoring is more modest with just two horns joining the strings and the basso continuo. It contains some traditional traits but there are also modern elements, especially in that Kraus has left out parts of the traditional text of the Requiem Mass. In the Kyrie the words 'Christe eleison' are omitted, and sections like 'Dies irae', the Offertory and the Communion are also abridged. In regard to text expression one finds a contrast in the Introitus between "hear my prayer" set at high pitch and "to you shall all flesh come" at low pitch. It is the alto again who has one of the most expressive arias, 'Lacrimosa dies illa' (Dies irae). Another highlight is the Benedictus, a duet of soprano and alto. The Agnus Dei ends with the choir singing a capella "requiem sempiternam" after which the more vivacious 'Lux aeterna' closes the work. The last work, Stella coeli, dates from much later in Kraus's career. He has written it when he was already working in Sweden and was on a tour through Europe. When he stayed in Amorbach, where his father lived, Roman Hoffstetter, the choirmaster and organist of the local Benedictine monastery, asked him to set the text of the Marian antiphon Stella coeli to music. It is scored for soprano and tenor solo, choir and an orchestra of two horns, two flutes, strings and basso continuo. The organ solo in the middle of this work is remarkable. In the whole second section of this antiphon the organ plays a concertante role. 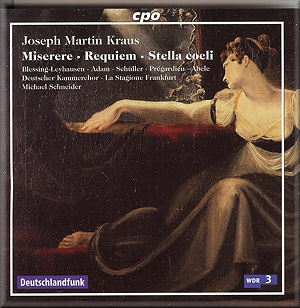 Although I wouldn't rate Kraus's sacred music presented here as high as his orchestral music, these three works contain enough memorable moments to make them well worth your listening time. The choir and the orchestra give very good performances, and the soloists - who are all also members of the choir - are mostly good as well. Annemei Blessing-Leyhausen has a nice and pleasant voice, but I am not very impressed by her diction. In 'Te decet hymnus' (Requiem), for instance, I found it hard to understand what she was singing. The contralto Carmen Schüller has a warm timbre and sings with much expression. Her male colleague Paul Gerhard Adam takes most of the soli, and he also sings with great expression. From time to time I felt that technically he was not totally secure. In particular in some leaps he sounded a little uncomfortable. Julian Prégardien, son of the famous German tenor Christoph Prégardien, is just 25, but his career is underway already, and it is not hard to understand why he is in much demand. He has a clear voice, excellent diction and a pleasant natural vibrato. His contributions here are outstanding. Ekkehard Abele is a regular in CPO recordings, and delivers good performances, as usual. All in all, this is a very good recording of three vocal works which support the view that Kraus doesn't deserve to be in the shadow of the masters. Michael Schneider and his colleagues have done him justice with this recording. I only wish CPO had done likewise. I don't know who was overseeing the production of the booklet, but he or she must have had a bad day at the office. The indication of the vocal scoring in the libretto is sometimes wrong. For example, track 4 (Ecce enim, from the Miserere) is not for soprano, alto and bass, as the libretto says, but for choir. In track 10 to 12 the Latin text and the German translation have been mixed up. It is not the first time I have noticed this sort of thing in CPO's booklets.